Hypoallergenic titanium BCR (ball closure ring/captive bead ring). 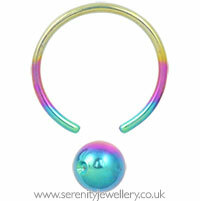 7mm, 9mm and 11mm internal diameter rings are closed with 4mm clip-in titanium balls. 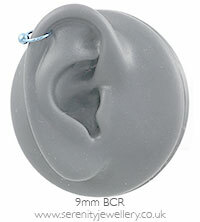 Plain polish 11mm BCRs have 5mm clip-in balls. So happy with my titanium hoop. Will be ordering all the colours soon. The selection is great, packaged well. Soddisfatta dell'acquisto. Orecchini come da foto e descrizione arrivati dopo 2 giorni dall'acquisto. Really simple, comfortable earring at a great price. Looks good and no allergic reactions. The only difficult is getting it on and off as I had to pull apart the ring as my earlobes are quite thick, but once you get them on and push them together again it's fine. I'm not planning on changing them often so it's not a massive nuisance. Would definitely buy again in more colours! These are lovely earrings and very easy to wear. I have worn them since I bought them and sleep with them in. You wouldn't know you are wearing them they are so comfortable. They were much cheaper than than high street stores.